Summarized View: Indexed Universal Life. Pay premiums with after-tax income. Super-Charge investment growth by over-funding the policy to take advantage of tax-deferral. Borrow money from the overfunded amounts in the policy at a very-low interest rate. Lower the amount of Life Insurance in force as one gets older when the cost of insurance gets expensive. Let illustration software show you the maximum amount of cash you can "dump in" to the policy to enjoy "tax deferral" and eventually "tax free" money. Indexed Universal Life - More Bullet Points. The IUL is the only product in the USA that allows virtually unlimited investments that eventually can be withdrawn tax-free. A Modified Endowment Contract (MEC) happens if too much money is "dumped in." A MEC will cause a taxable event. The insurer will advise you in order to prevent this occurance. An IUL allows the policyholder to enjoy the upside of the stock market yet not lose money when the market goes down. Virtually every Life Insurer in the USA now offers an IUL. NAAAIP is Broker General Agency(BGA) for upwards of 50 such Life Carriers. Living Benefits, Accidental Death, LTC, Child & other riders available. Even More Useful IUL Information. NAAIP's CaseDesign Team will provide an informative IUL illustration often times within the hour. The IUL illustration is always sent to you within 24 hours during workdays: 8:30 to 6:00 ET. Our contact email for illustration request is located in the NAAIP BackOffice at CaseDesign. Contact [email protected] on weekends. Apps are available via I-Pipeline or CaseManager/Contracting Girl(contact in NAAIP BackOffice) upon request. Illustrations can be obtained via IGO, Winflex, carrier sales support, or CaseDesign (contact in BackOffice). As soon as an agent is appointed with a carrier, agent has access to underwriting, case design, commissions, etc. from the carrier. Once contracted the carriers are extremely helpful in providing illustrations, explanations, etc. The exception to the carrier being helpful is Banner Life. Banner wants the upline to be the conact venue for all agent issues. 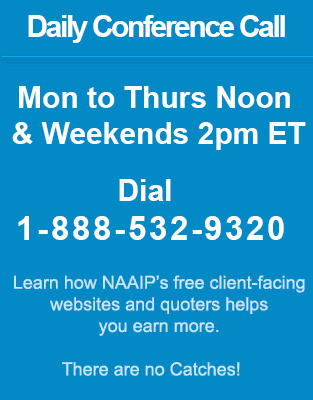 For Impaired Risk: Contact NAAIP's IUL Insurance Guru who is listed in Agent BackOffice. The IUL Insurance Guru will have the on-staff underwriter give you detailed answer within 24 hours. NAAIP's Favorite Carriers and Other Important Information. Allianz Life is the best IUL for getting cash out of the policy for tax free income purposes. Allianz's sweet spot is between ages 20 and 65. Allianz offers many unique index options, including the Bloomberg US Dynamic Balance Index II. (BUDBI II). It’s uncapped with a 145% participation rate. That’s just one of many options to choose from and the client is able to make changes on an annual basis. The software defaults to the best blend of index options that have produced the highest returns in the last 20 years. They offer the S&P, but most clients choose other options. Allianz also offers a guaranteed interest bonus (15%) starting in policy year 1. In addition, they own PIMCO and trade more in a given day than most carriers do in a month. Finally, NAAIP is very close to many of their executives and actuaries personally so we get some additional love. John Hancock is my favorite for older clients - over 65 - and for smaller polices. John Hancock has two good IULs. One is low cost and provides guarantees through life expectancy and generates some nice cash along the way. The other is designed to over fund and pull cash out. Both products are available with Vitality that allows clients to reduce premiums and earn points towards half priced Hyatt hotels stay and Royal Caribbean Cruises for healthy living. The client gets a free fit bit that allows JH to track their progress. JH also offers the best true LTC reimbursement rider on the market. If the client engages in the vitality program, it can almost eliminate the cost of the LTC rider. JH excels in the older ages and jumbo cases. For older very wealthy clients looking to finance coverage, we typically add their ROP rider which is used to pay the loan off at death while keeping the death benefit intact. Our JH rep, Andrew Szpiro, is the man and gets stuff done like no one else. Their latest Accumulation IUL is good for pulling out tax free income. JH is also very good with foreign nationals and will allow premium finance for foreign nationals. Protective Life GIUL. Great guaranteed IUL. We can get guaranteed DB out to age 100 or close and still have the benefit of participating in the index. They also offer a decent LTC rider and can annuitize the death benefit payout if the client so desires. Their latest living benefit rider allows one to guarantee the death benefit to 95 lowering the cost of insurance significantly. If the client goes on claim, the death benefit is still paid out. Protective Life also provide great sales ideas at www.sellwhatmatters.com. Columbus Life is consistently ranked in the top three IULs by IUL digest. They are owned by Western Southern and have a 96 Comdex rating. CL offers as table shave program from table 3 to STD up to age 70 and 1 mil in DB. Their index options are all based off the S&P, but they offer an annual uncapped strategy with a spread. The client gets the first 8%, CL gets the next 4% and the client gets everything after that. It’s pretty attractive. They also have high targets and the ability to blend them in the event you need to compete. Finally, they have one of the best no cost accelerated death benefit riders in the industry. It comes with every policy they issue and can be used to offset LTC expenses. They also offer some of the highest target commissions in the industry. The target can be dialed up and down as well. CL has made some recent adjustments that allow for even more cash to be taken out of their policies. Regarding compensation, when you look at the size of the commissionable target premiums, the comp is on par with everyone else, but optically, they are at a disadvantage. North American - also offers a very good guaranteed IUL. I prefer working with Protective, but their products are all pretty good. American National – good IUL, great living benefits. ANICO IUL Brochure - 24 Pages. Nationwide Life has an IUL very similar to JH’s low cost IUL. They also stole their LTC rider and made it an indemnification rider vs. reimbursement. LSW – great for small premium finance cases, good with older ages, liberal with foreign national business. Pacific Life: Good products, good carrier, not my go to per se. They illustrate well, but they are not transparent and they are not very broker friendly. That being said, we have written some monster cases with them. Minnesota Life offers a bunch of good products. However, they are not as good as Allianz and they have a very low retention – 2 mil. That means they go to reinsurance on every case over 2 mil. However, they have their place in the line-up. Ameritas Flex IUL: new kids on the block, but they may have the best living benefits out there. Possibly even a little better than American National. At one point, their IUL was ranked number one by IUL digest. Mutual of Omaha’s new IUL is decent. They allow premium financing up to age 81 and as low as 1 mil, but the cases fall apart in the mid 90’s. Zurich Life – their cost of insurance is pretty high, so client’s aren’t getting as much cash value as other carriers, but they are good with foreign nationals. Supposedly they are coming out with a high early cash value rider in January, 2019 that will guaranty 100% CSV in year one. However, the comp will be low and spread out. Talk to us. We will walk you through contracting, illustrations and submitting your first case.